The ideal weight was conceived by the Metropolitan Life Insurance Company in 1943. Its purpose was to identify groups with the lowest mortality rates. Since 1943, other height and weight charts have evolved, using a variety of standards to calculate your ideal weight. According to current standards, a 5-foot 1-inch woman's ideal weight ranges from 95 to 115 pounds, while a man's ranges from 101 to 118 pounds. Bone as well as fat contributes to your weight. If you are large-boned, you weigh more than someone else of the same height who is small-boned. The Nutrition and Food Web Archive, or NAFWA, uses the Hamwi formula to calculate weight by frame. To measure your frame, Met Life indicates that you should place a finger on either side of your elbow with your arm upright. The distance between your fingers should be between 2¼ inches and 2½ inches for a medium-framed woman who is 5 feet 1 inch. If the space is any less than that, you are small-boned, and if it is any more than that, you are large-boned. 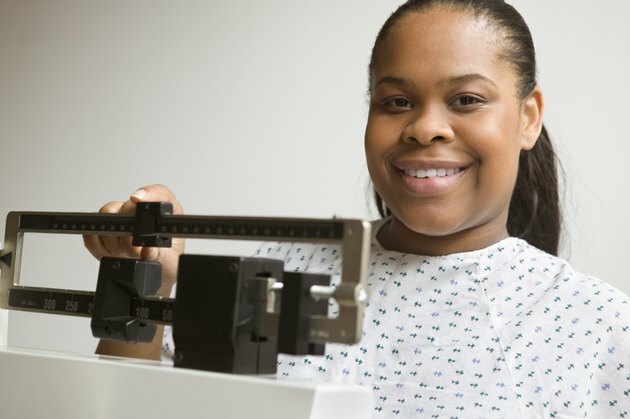 According to Rush University Medical Center, the best indication of whether or not you are at your ideal weight, no matter how tall you are, is your body mass index, or BMI. The BMI charts use your height and weight to calculate your BMI. The higher the BMI number, the more likely it is that you are overweight. The Centers for Disease Control and Prevention, or CDC, indicates that your BMI should be between 18.5 and 24.9. Over 30 is considered obese. The CDC suggests that the circumference of your waist is more important than your overall weight. Regardless of height, men should have a waist circumference of less than 40 inches and women should have one less than 35 inches if they are not pregnant. If your waist measures more than that, you may be at risk for coronary artery disease, high blood pressure or type 2 diabetes. Most people don’t realize that when measuring your height and comparing it to a standardized chart, the chart assumes that your height is actually one inch more than you stand in your bare feet. Most insurance company charts -- not just Met Life’s -- assume that you are wearing 1-inch heels. In addition, standard height and weight charts generally don't apply to individuals under 25 years of age or the elderly. Rush University Medical Center' height and weight charts and the Hamwi formula provide similar results. The University's chart and the Hamwi calculator both indicate that a man should weigh between 101 and 123 pounds if he is 5 feet 1 inch tall. A woman of the same height should weigh 6 to 7 pounds less, or 95 to 116 pounds. In contrast, Met Life's charts were revised in 1983 and now indicate that a 5-foot 1-inch woman's weight may range from 106 to 140 pounds, depending on her frame size. Met Life doesn't provide weight ranges for men under 5 feet 2 inches.